A White-rumped Sandpiper (Calidris fuscicollis) forages on the mudflats of Jamaica Bay NWR. Today I'm sharing another image from my trip to Jamaica Bay NWR in Queens, NY. While lying out on the mudflats, I had the opportunity to photograph and observe flocks of small Calidris sandpipers, collectively known as "peeps." In among the many Semipalmated Sandpipers, I had the opportunity to photograph a couple species I had never photographed before, including this White-rumped Sandpiper. Peeps can be tricky to ID sometimes, however with the benefit of observing the bird only a couple feet away, plus photographic evidence, the ID on this one wasn't particularly hard. Notable field marks in this image include: the relatively longer bill, drooped slightly at the tip; the more prominent white supercilium (eyebrow stripe); wing tips extending noticeably beyond the tail; dark streaks on the breast and extending under the wings; orange at base of lower bill. The longer wings also give them an overall more "elegant" shape than most of the other peeps, particularly Semipalmated Sandpipers. Not visible is the fact that this species has an all white rump patch, as opposed to other peep species, which have a dark line going down the middle of the rump patch. 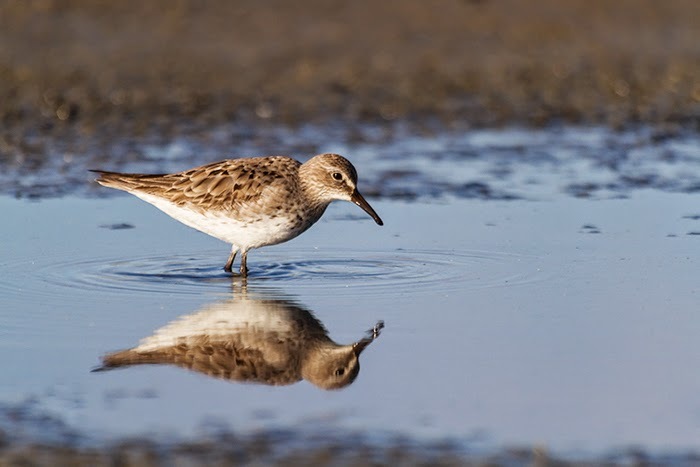 Behaviorally, White-rumped Sandpipers tend to be comfortable foraging and probing in deeper water (which this one was), particularly in comparison to the other long-winged species, the Baird's Sandpiper, which tends to stay in drier areas. Thanks for visiting. More peeps later this week!